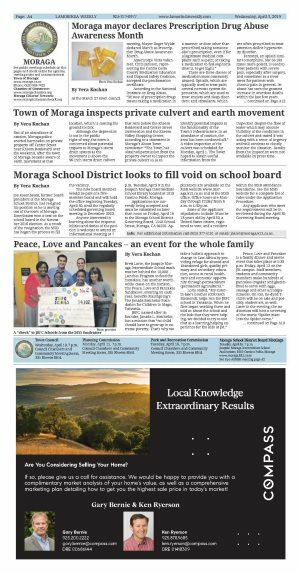 Out of an abundance of caution, Moraga police erected barricades on private property off Center Street near Rheem Boulevard over the weekend, after the town of Moraga became aware of earth movement at that location, which is causing the ground to sink. Although the depression is not in the public right-of-way, the town is concerned about potential impacts to Moraga's storm drain system as the movement is above the 96-inch storm drain culvert that runs below the Rheem Boulevard and Center Street intersection and the Rheem Valley Shopping Center, according to a statement in Moraga's About Town newsletter: "The Town has obtained permission from the property owner to inspect the private culvert so as to identify potential impacts to the functionality of the Town's infrastructure. In an abundance of caution, the area has been cordoned off." A video inspection of the culvert was scheduled for Monday, April 1. The Town hoped to obtain useful information from the inspection despite the flow of water which may obscure visibility of the conditions in the culvert and stated it was acting with a sense of urgency and will continue to closely monitor the situation. Results from the inspection were not available by press time.